a first aid kit in your car at all times anyway, so another kit in your range bag isn’t a big deal. Of course! You’re going to need ammunition, but you should take all you’re going to shoot. Trigger time is what’s going to help you in the long run, so it’s good to put as many through your pistol is possible. You should be practicing reloading, too, so having your extra magazines is paramount. This is probably the only thing that I regularly forget when heading to the range. In my range bag, I now keep balloons because they’re cheap, compact, light, and help me with tactical drills (shooting until the “threat” is gone, the popped balloon signaling this accomplishment). But you should grab your paper targets too; even if you have to fold them. Depending on where you do your shooting, you’ll need a way to hang your targets. Some ranges have vertically mounted pieces of plywood, some have stakes and chicken wire (like the range I haunt). So, either a staple gun (don’t forget staples, y’all) or clothes pins can hold your targets up. You need the marker (particularly a black and permanent one) to circle previous shots for easy acquisition. The measuring tape doesn’t have to be big and bulky, just long enough to measure shot groups. This is just in case you run into a malfunction and need to get your pistol back into operational order. Otherwise you’ll be wasting valuable range time. Well yeah, we’re not talking about archery here, so you won’t need a bow. But if you have more than one concealed carry pistol (and you should, check our post about this) then you need to practice with both. And you also need to practice unholstering and reholstering as well. 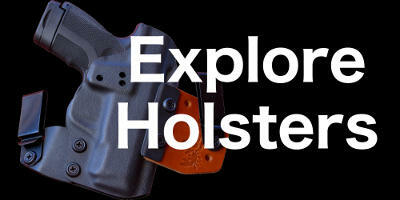 Don’t bring your whole collection, just bring what you intend to practice with because holsters can take up quite a lot of space. Finally, if you’re only bringing a few pistols, and can separately and safely store them, go ahead and pack them in your bag as well. Are there any other items I forgot to add to this list? I wouldn’t say ALL of this is a necessity considering where you’re going to shoot. If you’re going to an indoor range, you can be confident they will most likely have first aid kits and even a gunshot trauma kit available. Still doesn’t hurt to maintain a first aid kit in your car though. Also depending on the gun range, you may not be able to bring ammunition and have to purchase from the range. Usually it’s because a liability issue arose and they can’t have reloads or explosive ammunition risking safety or damage to the range. I would also say the most important is to bring a good attitude. Nothing will make your time at the range less than stellar than being angry and shooting off-mark…. making you even more angry. Also if you’re not in a receptive mood, you chance ignoring cues from a range safety officer or an instructor’s tips.